Why We Need a Simpler HVAC Design Methodology | Russell King, M.E. First of all, let me make one thing perfectly clear. The ACCA Manual J/S/D residential HVAC design methodology is the premier methodology available today, and has been for many years. It is the most precise, accurate and refined process for designing residential HVAC systems in the world. It has gone through the rigorous ANSI certification process and has been reviewed and scrutinized by many of the greatest experts in the field. It’s not perfect, but it is the best, hands down. That being said, there is a problem. The ACCA Manual J/S/D methodologies and the software programs that are based on them (Wrightsoft and Elite) are very complicated and have a very steep learning curve. I first started doing HVAC design back in 1988 using handwritten ACCA worksheets. That was probably an advantage because it forced me to understand each and every calculation and to be very careful about every assumption made along the way. If you made a mistake at the very beginning but did not discover it until the end, you spent a lot of time re-doing the worksheets. It was very tedious, but very educational. Computer software programs have made the calculations much easier and allow the user to do multiple “what if” scenarios instantaneously. ~~ What if they added ceiling insulation? – CLICK – answer. What if they used low-E windows? – CLICK – answer. ~~ The computer software also allows users to make very BIG mistakes very quickly. There are many, many seemingly innocent little input fields scattered throughout the programs that have huge impacts on the final results. There are also a large number of input fields that have absolutely no impact on the final result. A large portion of the learning curve is figuring out which is which. 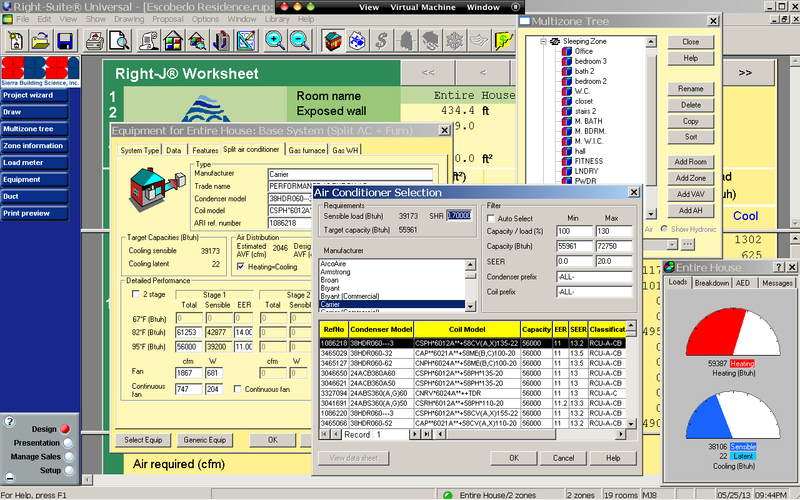 This is a screen shot of a project in Wrightsoft’s Right-Suite Universal software. It makes me think of a control panel in a nuclear power plant. This is very intimidating, even to someone who is relatively computer literate. It takes years of experience and dozens of projects before someone can become comfortable with this level of complexity. Both software packages cost over $1000 when you get most of the important features. The software programs have also added a lot of really fancy features such as pull-down equipment libraries, estimating tools, and parts lists to name just a few. In my opinion, these “features” sometimes clutter up the software and make it easier for people to make mistakes. I truly, truly wish that every HVAC designer in the country used ACCA Manual J/S/D on every new home, addition, renovation and even most equipment replacements. I honestly believe that 90%+ of existing homes would be well served to have their systems evaluated and re-designed based on ACCA Manual J/S/D. Unfortunately, that will not happen. Despite some really excellent training, much of it subsidized, Manual J/S/D is beyond the ability of the vast majority of HVAC contractors. I don’t mean “ability” in terms of aptitude or intellect, but in terms of time and resources. They don’t have the time to learn it or the time to perform it. A good introductory J/S/D class is at least two full days long. I personally have taught three-day classes that seemed like they only scratched the surface. Again, don’t get me wrong. I am a huge proponent for more ACCA J/S/D training. It’s just that after teaching these classes multiple times and having performed about two thousand designs myself, I don’t think it is an appropriate level of precision for the vast majority of designs out there. To do a full-blown Manual J/S/D design from start to finish on a typical home would take the average user 4-6 hours. From the time you hand them a set of plans and they turn on their computer, to the time you get back a design detailed enough to install from, takes at least that long. This is a very expensive investment in time and energy, especially if it is just for bidding purposes and does NOT include the time it takes to draft up a presentable, full size set of plans that could be turned in to a building department for review and approval. I strongly believe that most designs could be accomplished using a methodology that takes about one-fifth of the time. I’ll stick my neck out and say that 80% of the residential HVAC systems being installed today could be accomplished using a far more simplified approach and result in a system that is just as good as one designed using a full J/S/D approach. When you step back and realize that residential HVAC equipment only comes in a few sizes and residential ducting only comes in a few sizes, it makes one wonder why we are being so precise in the calculations. Think about it. The difference between a 3-ton system and the next larger size, 3.5-ton system, is an increase of 25%! The difference in airflow between a 7” duct and the next larger size, 8”, is about 40%! Why are we spending so much time on calculations that only have small impacts on the total cooling load and even smaller impacts on room loads? They both relate to the need to put an appropriate amount of time and effort into what you are doing and realizing how that will impact the final result. I believe that the current approach to HVAC design results in far too much hair splitting and results in answers that are very precise, but often wrong. Not because the methodology is wrong, but because it is being applied wrong. I am a firm believer that if you want to change an industry you have to do it in baby steps. You can’t expect even a portion of contractors to suddenly start using a process that requires such an investment in time, effort and money. That is why we need something in between the horribly inadequate design process used by MOST contractors today: a combination of rules-of-thumb and trial-and-error, and the full-blown ACCA J/S/D process. We desperately need a more simplified design methodology. One that is not intended to replace ACCA J/S/D in any way, but is intended to be a stepping-stone to learning the full process. I’ve referred to it as a “gateway drug”. The goal is to get people used to following a formal design process, albeit a greatly simplified one. Once they get “hooked”, then we lay the “heavy stuff” on them. I think we all want the same thing: to have homes that are comfortable, efficient, and affordable to operate. We need to be able to make a decent living designing and installing systems, and homeowners should get what they pay for. WOW! Russ you are so right, I have been in this wonderful trade for over 35 years, the last 5 as a full time instructor for a apprenticship program (10 years part time) and have worked for one of the largest union residential new construction HVAC companys here in So Cal for 10 years, what a nightmare. I really enjoy reading your blog posts and have learned so much from your realistic approach. Keep mup the great work! Thanks, Dave. The funny thing about it is that there is no “right” answer for designing a residential system. There are tons of wrong answers but no one can tell you, between two reasonably designed systems, which one is better. This is because we have no way of knowing how picky the occupants will be about temperatures, what the actual weather will be like, how the occupants will operate the home, whether trees or buildings will go up around the building. It’s like trying to measure the dimensions of a giant pulsating blob to the nearest quarter inch. Can’t be done. Thanks very much for your comment. It’s funny because right now I’m dealing with this exact problem. I just recently purchased software for Manual J,S, and D. I’ve taken the Advanced HERS classes for the software at least 4 times, and still forget a step or enter wrong data somewhere along the line. I think it would be easier to start on paper, this way every step would understandable, then I could see where my mistakes are. Does Energypro use ACCA Manual J for load calculations? Thanks for your question. EnergyPro uses more of an ASHRAE based load calculation, which is considered “equivalent” to ACCA. They give similar answers. The problem is that it is a lot of work to get room-by-room loads from EnergyPro. The EnergyPro folks and the Elite Software folks (an ACCA J/S/D software) had talked about letting the two programs talk to each other (i.e., use the draw feature in Elite to do the take-offs and then export that information into EnergyPro). I’m not sure where that ended up. With the new simulation “engine” going into the 2013 version of EnergyPro, I suspect that that is all up in the air for a while. Thanks for the response Russ. The reason I ask is, I did a manual J calculation on a 3000 sq. ft. new construction home and came out with 37,000BTU’s of cooling needed,and the energy consultant came out with 49,000BTU’s of cooling…..huge difference! I actually have more sensible internal loads in the whole building than the consultant does. I’m baffled as to why there’s such a huge difference in cooling loads using two different programs, I double checked windows, glass, insulation, and square footage….at this point, I’m stumped. That’s a pretty big difference. Ask the energy consultant to give you a copy of the “load details”. I forgot the name of the exact report, but it has all the line-by-line loads broken out by walls, windows, floors, infiltration, ducts, internal gains, etc. Then try to print out similar information from Right Suite. The pie charts are a good start, also the report called “building system summary”. Be careful when comparing window loads, Manual J combines conduction and radiation into one number, which I don’t like. EnergyPro will show them separately. When comparing the two load calcs line-by-line, something should jump out at you. I’m guessing windows, duct loads, and/or infiltration. Good luck. Let me know what you find. Thank you Russ, I will try to compare the two. In your opinion which computer program would be easier to use for a Comfort Advisor and or the worker bee who gets the write up from the comfort advisor to properly size and design a “Retrofit” in a residential home. I have worked with many contractors in the past that just used the “Rule of Thumb”. I myself understand the need to do it right according to the standards set for our industry. When investing over $1,000.00 in software just to find out later that there is a “more user friendly” version out there. Sorry it took so long to reply. I was teaching out of town last week. The only two HVAC design software programs I am familiar with (and know of) are Right-Suite and Elite Rhvac. The are both equally non-user friendly, in my opinion. I suggest you download trial versions of both and play with them. As a homeowner, who’s also an electrical engineer, I can honestly say that I have put off replacing hvac systems in two separate homes I have owned. The first was a 1300 square foot house, slab floor, one story. The furnace was installed in 1982 and was an 80% efficient (at the time of installation) 100,000 btu gas furnace. We had 3 contractors in to offer bids. Two of them told me they would use the same size. I was left shaking my head, because at that time, I was looking at a 96% efficiency furnace. Which means I would get out 96,000 btu’s of heat rather than 80,000. And for a house that small, I can’t imagine why I would need that much heat…unless I left the windows and doors open all winter. When asked about a Manual J, I got the same response from all 3…”I’ve installed plenty of these things in similar homes, I don’t need to do one”. So, I got a pretty bad taste in my mouth from those discussions and have become determined to be able to tell the difference between a designer and an installer. And figured as a homeowner, I should know enough to talk intelligently on the subject of design, possibly more so than an installer could. Flash forward a few years, new job, new house and this house has 2 furnaces. An electric in the attic and a natural gas in the basement. I start researching yet again and find some insight into the manual J. The manual J takes into account a lot of small things that will change more than once over the lifetime of the furnace. Things like blinds (and their status as to how much light they let through), curtains, heat from lighting sources, etc. I do not believe these things belong in a heating/cooling calc for most homes, as their status depends on occupant taste and habits. As a homeowner, I simply want to know what will work best in my home. As someone who seems to do more research than most homeowners, I am also interested in ways to make the system more efficient….determining airflow balance per room rather than just the house as a whole, or reducing drag in ducts to allow a smaller sizing of blower motor or establishing minimum run times per cycle so as not to short cycle the hvac. I am having a heck of a time finding much information on these concepts. But your blog is good. I know I am responding late, but have just found it out.